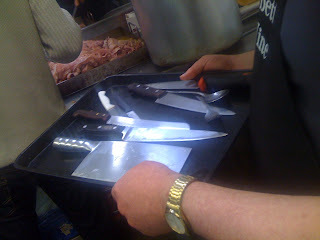 Vince Garreffa, butcher to the stars, is a master of the porcine arts. He's the sort of guy who gets up at six o'clock on a Sunday morning to boil three pigs' heads to make brawn for his charcuterie class. I've been looking around for decent cooking classes in Perth, and Mondo di Carne's meat classes seemed like a pretty good bet. I booked in for five classes: two on charcuterie, two on boning and cooking lamb, and one on breaking down and cooking poultry. I really wanted these classes to be good. I recently took a class on seafood cooking at another local cooking school, and it was disappointingly rudimentary, as if it was designed for people who have never been in a kitchen before. The first Mondos class was exactly what I was looking for! There was not a single shriek at the sight of the boiled pig's head (above), and everyone seemed to be pretty into food and cooking. Vince Garreffa first explained to us about the role of sodium nitrate ("pink salt") in curing meat. He then showed us some partially-cured pancetta and demonstrated the 'massage' or 'kneading' process that must be completed daily. We were shown how to make duck prosciutto and smoke our own chorizo, and the main part of the class revolved around making brawn. He'd started the morning by boiling a massive vat full of three pigs' heads, a few beef tongues and various other lovely animal parts, which he spread out on huge roasting trays and asked us to chop. The chopped meat was then mixed together with a few handfuls of capers, some salt, pepper, parsley, garlic and red wine vinegar, ladled into plastic containers and topped with a bit of the boiling liquid that had become rich and gelatinous from the trotters that were included in the mix. Next week we each get to bring home our own little container of brawn that we helped make! As well as teaching us all sorts of valuable little meat-related tips (his method for creating an improvised hot-smoker was particularly revelatory for me), Vince taught us all about the difference between good meat and bad meat. At various points he would teach us how things should be done, and then tell us about the way supermarkets do things. All hams, it seems, are not created equal. I appreciated getting a bit more information about the distinctions between well-prepared and poorly-prepared meat. Sometimes it can seem as if avoiding the supermarket is just a bit of foodie prejudice, or a culinary fashion statement. 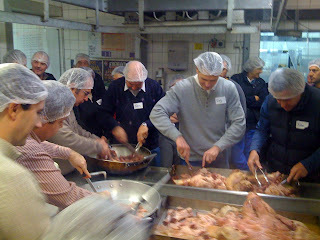 Vince's descriptions of supermarkets' meat preparation techniques confirm that there is a world of difference between smallgoods prepared by respectable artisans and mass-produced stuff injected with water and chemicals. I've already done a fair bit of reading about charcuterie, mostly the writings of my favourite food writer Michael Ruhlman, but this is definitely an area of cooking in which it pays to get some hands-on instruction before trying things yourself. There's no way for a book (or a TV show) to tell you how a partially-cured duck breast should feel, or how hard you should massage your pancetta. I think the classes on boning and breaking down lamb and poultry will be informative in the same way: instructions to "slice the knife along the saber bone to the joint" are all well and good, but what does that look like? How much pressure should I use? What angle should my knife be held at? What the hell is the saber bone? I'm excited about my remaining four classes, and I hope to start applying some of my newly acquired knowledge at home. If you're in Perth and looking to acquire a bit more skill in working with meat, I highly recommend the classes at Mondo di Carne. ha - vince garreffa - that guy's quite a character! Thanks for shearing such a nice and be useful post. I like it most and appreciate you for this great post. The best restaurants in Perth?